I'm going to get disbarred because of this, I can just tell. 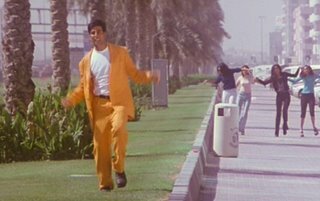 and Akshay's arm-flap/limp-wrist dance in "Jab Bhi Koi Haseena"
(please note here that his suit is the same color of the mango margarita I consumed during the first half of this movie) - you'd think he would've dream-sequenced himself a better dance, because if you're going to arm-flap, you should do it like "Woh Ladki Hai Kahan," and even then it's a risk because no song will ever be as good as that, so maybe we should just retire that move completely. Maybe it's because I'm relying on subtitles that are not as frequent or as accurate as they might be (and aren't in the songs at all, so I can only imagine what's going on with the flapping and limp-wristing, which I am going to assume is not a heavy-handed gay joke, since Akshay is imagining himself Studly McStudlypants here, although there is that bit with him ogling sunbathers who turn out to be men - wackadoo alert!). On the other hand, my movie-fuelled Hidni is improving by the day. It should also be mentioned that Abby had a bit of an Akshay Kumar epiphany, mainly that she was in mid-sentence about how she generally enjoys him, especially on stage with his martial arts props, when he came splashing through the ocean on a horse, and she lurched gears into "I luuuuuurve him." All you have to do is put a man on a horse and she is powerless. Does anyone know of any scenes of Saif on horseback? Okay. The movie is going back into the DVD player. 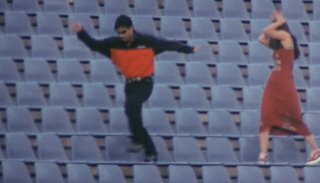 The critical mass of popular opinion compels me to finish, and it's not as bad as Kyon Ki, which, as the only Indian movie I've ever jettisoned, is my unrivalled yardstick for truly bad. Beth, don't feel bad if you don't finish it. I haven't finished it, either. Does fast forwarding all but the first 20 minutes of the movie count as seeing the movie? I just couldn't bring myself to watching it at normal speed. I've been on a quest since early spring, when I got hooked on Bollywood, to see as many movies as I can before the fall tv season starts and my viewing time will be limited. So far, after 80 some movies, I've only truly jettisoned one movie, and that was yesterday when I tried to get through Jaani Dushman. I know, but I saw it at the library, and figured what the heck. I made it to 30 minutes. JD - Jaani Dushman is famously bad. I'm going to watch it later this month (with a friend who's coming to visit and bringing his copy). I'm impressed you made it through that far. And yes, fast forwarding counts. I say I've watched Gumnaam and I did that. I'd love to hear more about your quest! Beth - I watched Hera Pheri a few years back, but I remember that Paresh Rawal's character - his accent and dialogues in particular - was what I enjoyed the most. And I can see how the specificities of the accent are lost when one watches the film with subtitles. Also, this film was "inspired" by a Tamil film made in 1990 (Arangetra Velai) [http://www.imdb.com/title/tt0214486], and I have to say that the Hindi remake isn't too bad. Paresh Rawal portrayed a very eccentric Maharashtrian old man - he did a great job with the accent, quirks etc. Aswin - wasn't Hera Pheri inspired by a recent Manivannan movie? Akshay's best movie in my opinion is Khakhee. Hope you watched it. Babasko - I certainly don't dislike Akshay Kumar. I haven't seen enough to say, really. He seems to have a sense of humor, and that goes a long way in my book. He was entertaining live, although I did think perhaps he had lost his mind when he started singing some sort of spiritual song with whooshing clouds and golden ohm symbols on a screen behind him. My most trusted Bollywood source, Obi Wan, told me awhile ago that he thinks Akshay Kumar is a really gifted comic actor, and that was what really opened my mind. I mean, you have to believe a person named Obi Wan, right? @Aswin, it wasn't a tamil movie, but a mallu one...which went on to be remade in many languages...the one in Hindi being made by the same director who made the one in Malayalam, i.e. Priyadarshan, not sure about the other languages. I love your blog. I've recently discovered the rich undercurrent of western viewers enthralled by bolly. Your descriptions and the images are the best. I can certainly understand your lukewarm reaction to phir hera pheri. It relies as much on its dialog/accent/regionalist quirks-stereotypes as on the slapstick. There's no way a subtitle can convey the twang of the texan accent or the lazy pull of the southern accent in US English, so I'm not surprised you didn't get it that much. I suspect you'll also not get munna bhai 2 all that much for the exact same reason. Bollyo (that's a fun nickname, by the way; I'm enjoying saying it out loud right this very minute) - thank you thank you thank you for the kind words. Most of the time I don't even feel like I consciously choose to write about Bollywood - I watch a movie, and out it comes. I'm grateful for your analogy to American English(es) - you're right, no subtitle can really tell you what a good "y'all" sounds like. Or, if you're from my hometown, a good "warshing machine." Somehow I escaped that particular peculiarity, probably because neither of my parents is from the place I grew up. Anyway.... I will go see Munna Bhai if I get the chance (after I finally rent #1! ), but mainly because I'm on a new quest to watch Arshad after meeting him this summer. And yes, learning some Hindi is in the works. I have a "teach yourself" book and CD, but I think I'd do much better with an actual class or structured tutoring. I need to find someone locally, which shouldn't be too hard. I also need to get over being intimidated by the script, which right now is really scary to me, even though rationally I know I can do it. Anyway, you can recommend me things any time, and I'll just keep a file if I'm not ready for them!